The Architectural Review Australia holds an annual architecture ideas competition which seeks to identify innovative development concepts for a chosen site. The brief for Proposition 2065 was to design a mixed-use development for a site in St Leonards, Sydney, as part of a Transit Oriented Development immediately adjacent to the train station and major road intersection. The design responded to the brief by incorporating a series of urban public spaces varying in type and scale. The response includes commercial and retail space, residential apartments and a community green that encourages pedestrian activity and connects the site with Talus Street Reserve and Chandos Street Park. One of the key features of the design is the inclusion of a flowing ecological corridor (ECOLabyrinth) that creates fluid connections beyond the site. The ECOLabyrinth is a fusion of sustainability and architecture. It is a living machine that cools and purifies air, dampens noise and reuses organic waste to grow produce. It enables the built and natural environments to function coherently. Fresh, cool air purified on site. 20% of precinct water supply from rain water. 100% of water used and treated on site. 100% organic waste recycled to grow produce on site. 60% precinct electricity requirements generated on site from renewable sources. Low energy demand due to passive ventilation, chilled beams and TriGeneration systems. Office towers are designed as a series of buildings to optimise natural daylight into the office space. Housing is placed above the commercial optimising the view to and from the apartments. Australian Architectural Review (AR) recently awarded Peddle Thorp Architects, Melbourne and Sustainable Built Environments (SBE) a commendation for their finalist listed entry in the Proposition 2065 design competition. The major strengths of this scheme related to the way scale and connectivity have been handled. The fractured volumes of the key buildings were seen as a clever response to both of these challenges, allowing for both permeability and a dissolving of building mass. The jury also saw the embedding of community programs deep within the heart of the site and integrated into the artificial topography as a good strategic move, as an activation of the ground plane. The jury acknowledged the improvements made to Peddle Thorp + Sustainable Built Environments’ proposal since Stage 1 of the competition, particularly in defining the complex artificial ground plan and the effects of the public domain on the linkages with the key grade connections to the locality. Proposition 2065 competition is a two stage, open to all architects and anonymous. The competition’s aim is to produce innovative architectural concepts and development solutions for a specific Australian site. 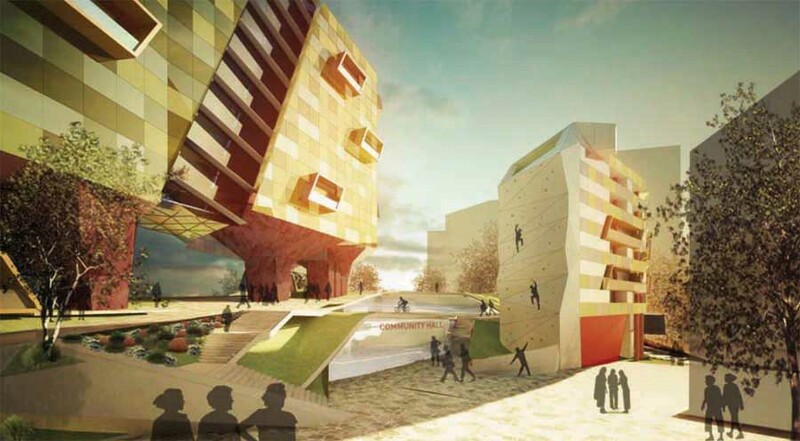 The brief for 2010 challenged entrants to design a mixed-use development for a disused site in St Leonards in Sydney, immediately adjacent to the train station and major road intersection. The jury composition, associated workshops and selection criteria reflect a competition that attempts to balance the design potential of a site and the economic realities of commercial development.